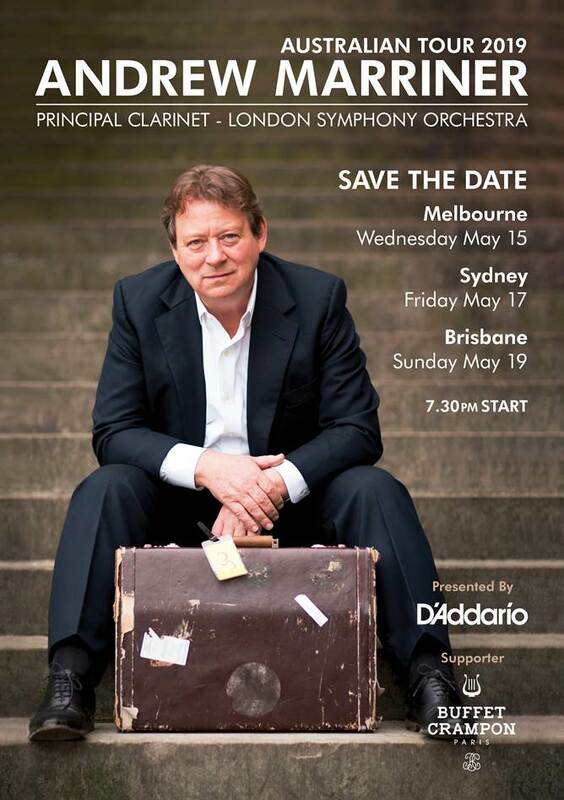 One of the world’s premiere clarinetists, Andrew Marriner will perform in Melbourne (May 15), Sydney (May 17), and Brisbane (May 19). These unique events will be an opportunity to hear Andrew Marriner perform, speak about his remarkable career, for audience members to meet Andrew and even sample and play the latest in mouthpieces, reeds, clarinets, and accessories from D’Addario and Buffet Crampon. Venue and booking details coming soon. In the meantime Save The Date!Head to the D’Addario Australia – Woodwinds Facebook and Instagram pages for updates and information. D’Addario Australia acknowledges the generous support of Buffet Crampon.